Polyunsaturated fats in the diet, also known as omega-3 fatty acids, are essential to human health because they cannot be produced in the body and must be consumed in the diet. While these fats are essential to health, over-consumption may have adverse effects that pose health risks in some individuals. Omega-3 fatty acids are needed in the body for many reasons. This heart-healthy fat helps to reduce all kinds of inflammation in the body. From arthritis pain to acne redness and scarring, polyunsaturated fats reduce and repair inflammatory sites in the the body. In addition to this benefit, omega-3 fatty acids are also cited for helping with brain and memory performance, supporting the nervous system and reducing scars and acne by the University of Maryland Medical Center. Symptoms of severe depletion or deficiency of polyunsaturated fatty acids in the diet may include poor memory, fatigue, dry skin, mood swings and depression. Omega-3 has also been proved to help in some children's cases of ADHD. Women who consume at least two servings of fish per week probably are getting the right amount of dietary omega-3 in their diets. People who have specific health concerns that are shown to improve with omega-3 supplementation are instructed to consume 1,000 mg to 3,000 mg each day. With a doctor's supervision, up to 4,000 mg per day could be consumed, however this is where risks come in. While omega-3 fatty acids have important health benefits, a balance is needed in the body. Over-consumption may be seen in those who take supplements without instruction or supervision from a doctor or qualified health professional, those who are taking blood thinners or bruise easily, and those who already consume more than three or four servings of fish per week. According to the University of Maryland Medical Center, over consumption of omega-3 fatty acids can cause the blood to thin, increasing the risk of easily bruising, or excessive bleeding if an injury were to occur. Individuals who are taking blood thinning medications such as warfarin or clopidogrel should not supplement with omega-3 unless instructed to do so by a doctor. 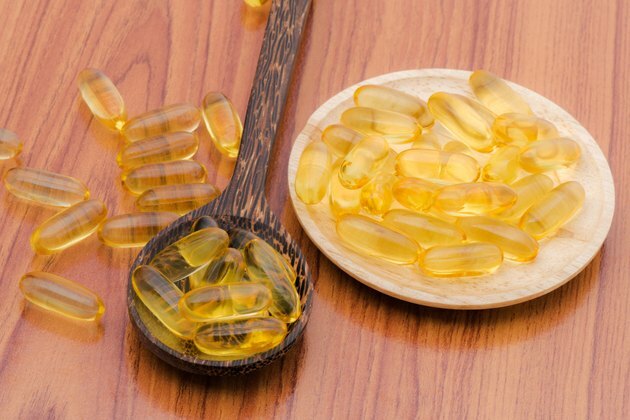 When fish oil supplements are the main dietary source of omega-3s, it may cause some bloating, belching, gas and diarrhea when taken in amounts that are too high. Over-consumption of omega-3s may increase the risk of prostate cancer in men, however more research is needed in this area. Fish oil supplements may contain traces of minerals such as mercury, which is also found in fish meat. Over-consumption of fish oil supplements that contain mercury are shown to have negative effects on brain development in unborn children as well as young children who are still growing and developing. Consult a doctor for your individual needs with omega-3 supplementation, and do not take more than has been recommended. Fish oil supplements may be hard to digest and leave a fishy odor on the breath. These supplements are a concentrated and less natural approach to getting omega-3 in the diet. Food sources of omega-3 include nuts and seeds, fish meat and other seafood products such as seaweed and kelp, as well as flax oil and other nutritional oils like hemp seed and canola. Omega-3 fat molecules are delicate and should be used in low-heat cooking to preserve the integrity of the molecule.